The New England School of Metalwork is a full 501-C3 non-profit educational facility devoted to the promotion and strengthening of metalworking skills. Started in 2000 and located in Auburn, Maine, the concept of the school was developed by Maine Oxy, a local welding distributor and Dereck Glaser, a local artisan metalsmith. After several years of individuals inquiring about welding skills and ornamental metalwork instruction the decision was made to build the school. We set to the task of designing and planning a dual purpose facility for metalsmithing and welding. In February of 2000 the newly constructed 2900 square foot facility opened its doors for the first class. Our metalsmithing studio is thoughtfully designed and fully equipped for up to six students. A line of coal forges and gas forges form six stations, each equipped with a full array of hand tools, anvils and vises. Two large pneumatic power hammers, treadle hammer and hydraulic press and an ever growing assortment of power and hand tooling. Also sharing the space is a fully equipped, state of the art welding school. Courses are currently being offered in MIG welding, TIG welding, Shielded Metal Arc Welding of various skill levels and materials. Since 2002 the New England School of Metalwork has had nearly 75% of its courses approved for VA benefit. You can use your VA benefit for Blacksmithing, Bladesmithing or Welding, call or email us for further information. In 2005 we began to pursue building a Bladesmithing program and by 2009, we were accepted as the third school in the United States to be endorsed and affiliated with the American Bladesmith's Society. We now offer a year round curriculum of approved courses taught by ABS master bladesmiths from all over the country. Also in 2009 we completed renovations to the second floor above our offices and classroom to offer dorm rooms for those on a budget. A resounding comment of students coming in from out of state was that the cost to stay locally in the area was higher than tuition, our offer is a clean, cheap and simple dorm style alternative and BYOBed and Bath linens if driving here, we provide them if you fly here. In 2012, the welding program began offering a comprehensive daytime course of 360 hours. This brought the NESM to a whole new market of craftsmen wanting to devote a sincere and intensive amount of time to the welding trade. In July of 2014 we split the Metalsmithing and Welding programs into their own buildings based on significant growth and the need to offer more courses to our growing student base. Welding expanded to offer more courses and the metalsmithing program has expanded to a neighboring building and adding two more forging stations and enhanced tool layout. We also can offer private one on one tutorial time in welding based on time/space availability. Rates vary depending on the tasks at hand and progress you want to achieve. We can arrange these sessions for companies working on certification as well as individuals wanting to try something new. Please inquire through the Contact Us page. The New England School of Metalwork is dedicated to maintaining a welcoming environment for everyone by upholding its community standard of diversity and inclusion. We value your participation and encourage you to contribute to an open and respectful exchange of ideas. We are equally dedicated to providing a friendly and harassment-free experience for everyone regardless of our differences. This code of conduct applies to anyone attending or associated with the school including, NESM staff, visiting vendors, guest instructors and seminar attendees as well as full or part-time students. Does a tool have a spirit of its own? One of the rules that the ancients taught about tools was that no one but their owner should touch them. A tool had a spirit and should only be handled by its owner. For centuries, craftspeople valued their tools; building elaborate toolboxes as virtual shrines to their precious tools. Then with industrialization and the conversion to factories; owners pushed for greater efficiency and mass production. They eliminated personal tools and required workers to check out implements from a central tool crib and return them after use. Pride in tools and personal standards of craft were destroyed. Some people scoff at these attitudes. To them, the belief that a tool has spirit is plain superstitious. "An object is an object," they say "nothing more and nothing less". But that attitude overlooks the opportunity to use craft as a means of self-realization. A spirit may be no more in a tool than in a temple, but the fact remains that for that spirit creates a tremendous change in the artisan. By respecting the spirit in the tool, the artisan really focuses on his or her own perception and skill. The true spirit in the tool is nothing less than the craftsman's pursuit of perfection. We at the New England School of Metalwork value this perspective as all the skills we teach are tool related. Weather your holding a hammer or Tig welding torch, the inherent perception of guiding the tool and the discipline of the mind lead to masterful work. Dereck started forging in 1983 at the age of fourteen, a couple years after learning about blacksmiths through the roll playing game Dungeons and Dragons. Once Dereck reached his late teens he was able to begin working in some of the shops in the Cincinnati area. All through college Dereck pursued metalworking of all forms, he earned a Bachelors of Science in Industrial Art Education and a minor in Art. 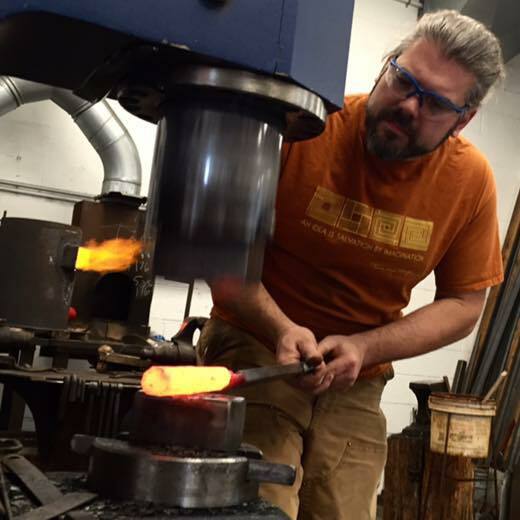 Dereck has taught at various other schools across the country and is a licensed educator in most of New England, his metalwork is spread throughout the Eastern United States. In 1996, Dereck was awarded the People’s Choice Award at the Alfred ABANA Conference and recently the Anvil’s Ring did an interview with Dereck about his career as a metal artist and the development of the New England School of Metalwork. His work reflects a traditional European flavor and emphasizes the methods and reasoning behind traditional joinery and the design aspects of many of the past and present masters that he has studied. In 1997 Dereck moved his family to Maine to teach Metal arts on a high school level and has subsequently moved to be the Director and Resident Blacksmith of the New England School of Metalwork in Auburn Maine. "Metal is an extremely forgiving and revealing material. I strive to stretch its abilities, pushing and pulling it like clay, I have found various aspects of its nature, secrets it only reveals when it is heated and forced into shape. 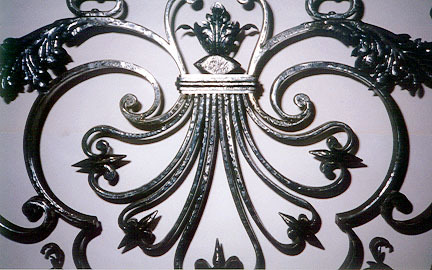 Utilizing these secrets and its natural properties, ferrous and non-ferrous metals can provide a timeless sense of stability and permanence. They often provide their own textures and colors, they will support themselves even in the smallest sections and the speech imparted from form is inherent to everyone and apart of creating work that is sensible and alluring to the mind." 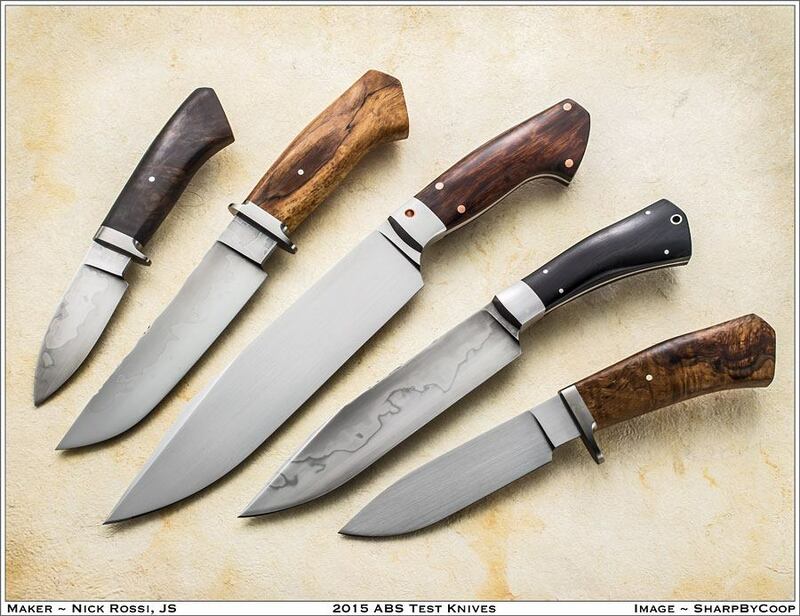 Nick Rossi has been making knives since 1999. He became fascinated with knives and swords at a young age and when he was 15 he was lucky enough to find a job in the largest cutlery store in the Northeast. Introduced to all sorts of knives, knife users and generous local knife makers he started on his path to creating handmade knives. Nick first taught at the New England School of Metalwork in 2007 and became a regular instructor. In 2011 he became a full time employee of NESM. Nick has appeared in Downeast Magazine, Tactical Knives and Blade Magazine. He is a juried Maine Craft Association artist and Juried Craft exhibitor at the MOFGA’s Common Ground Fair. Nick has his Journeyman Smith rating with the American Bladesmith Society. He operates Rossi Knives out of his studio located in Portland, Maine. Started working in the metal trades as a construction boilermaker in 1973. He helped construct and repair boilers in paper mills, generating stations, and incinerators throughout New England. As a boilermaker, Warren became proficient in the SMAW (stick), GTAW (TIG), GMAW (MIG), and FCAW (flux core) processes. Several boiler contractors certified him for welding on both plate and pipe. In 1996, Warren began work as a welder in a specialized machine shop in southwestern Maine. Here he used the GMAW, GTAW, and braze processes on stainless and inconel steels for customers in the oil industry. Some of the oil exploration equipment Warren had the opportunity to weld on at the shop is seeing worldwide service. Warren became the Resident Welding Instructor at the New England School of Metalwork in May 2002. He is responsible for the everyday operation and long term planning of the welding program. Warren has organized and instructed classes for individuals as well as for companies requesting weld training for their employees. His current welding certifications include AWS 1.1, AWS 1.5, and State of Maine Pipe in SMAW and GTAW. Warren has always called Maine home. He is a graduate of the University of Maine and University of Southern Maine. "Welding has become a vast, technical field. Welding machines are getting more complex, and there are newer electrodes for almost any application. The upside to all of these advances is that welding on traditionally difficult materials is becoming easier. There is a tremendous need for welders today. The more you know about welding, the greater your opportunities to gain employment in this field. There’s really no limit to the possibilities out there. I’m a firm believer in understanding both the technical and hands on sides of welding. The more you understand what is involved with a particular process, the better welder you will become. We can teach you the basics for several processes at the school. One of the school’s greatest strengths is its flexibility. We have basic and advanced courses in several processes. In addition, we can present specialized classes with very little advance notice. We now offer you sleeping and kitchen amenities along with your workshop. We added a nice kitchen area, 4 large bunk rooms an instructors quarter's and 2 large bathrooms for men and women as well as a spacious living room area, all right here at the school, making your stay hassle free and very affordable. Did I mention wireless Internet and free laundry service. NO! alcohol is permitted in the dorms. NO! smoking is permitted on NESM grounds. You must bring all your own bed and bath linens if driving and we will provide them if you are flying .NESM will not provide linens unless you fly into Maine. Reservations are made separate from your workshop tuition but at the time you enroll. Look for the dorm option when enrolling online. Arrival should be made before 4 PM the day prior to your workshop otherwise contact us for security entry code. Our rooms are very clean and comfortable, if your looking to take a workshop on a tight budget, this is for you.